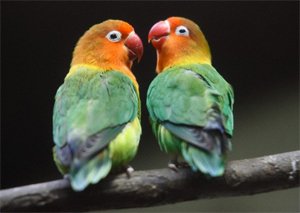 Lovebirds are smaller members of the parrot family from Africa and Madagascar. They belong to the family Agapornis Personata in Greek which means 'Agapa' (love) and 'ornis' (bird'). There are 9 species of lovebirds, and many different color varieties. They are known by the name 'Lovebirds' as they revel in living with a life partner, constantly together - preening,cooing and billing. But they can be kept alone as pets. They are very social and affectionate and require handling and attention daily. 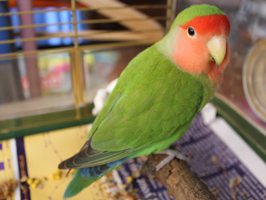 Varieties of the domestic lovebird are peach-faced, fisher, and masked. Cage Size :Minimum of 22" length by 18" high and 18" wide. Foods :Canary seeds, sunflower seeds, apples, green vegetables and Pelleted diets which provide balanced nutrition. Life Span :8 to 10 years. The most popular variety among lovebirds. Although they are quite independent, they make excellent pets. 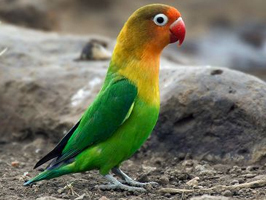 Peach Faced Lovebird is one of the most beautiful bird with a brilliant light-red face, blue rumps, gray feet and a horn colored bill. The eyes are surrounded by a light white ring. They have many different color mutations. Some of the most common include, Creamino, Lutino, Orange Faced, White Faced Blue, Blue Pied Dilute, Fallow, and Cinnamon. Origin :Northwestern Tanzania, south of Lake Victoria. Cage Size :18 inches square. These small lovebirds are admired for their beautiful coloration. The face is red in a bright green body; the forehead, cheeks and throat are bright orange, merging into yellowish orange on the breast and nape of neck. The rump is blue and there are blue, orange and black markings on the tail. The beak is red, the feet and legs gray. 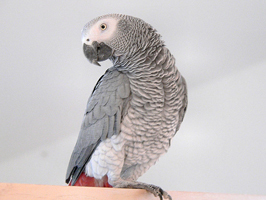 They are very active, always chattering, and interacting with each other or their owners. Easy to maintain. The Fischer's Lovebird comes in a wide variety of color mutations including, Albino, Pied, Black or Dark Eyed White, Dilute Blue, Dilute Yellow, Lutino, and Cinnamon. Cage Size :24 inches long by 20 inches tall by 24 inches wide. 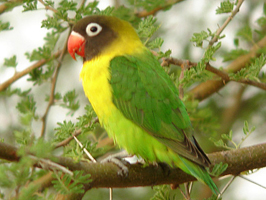 Foods :Pelleted diets are available for black-masked lovebirds and provide balanced nutrition in every bite. Life Span :18 to 20 years. The second most popular type of lovebirds after the peach-faces. Beautiful mutations are found among Masked lovebirds, including blue, dark factored, lutino, albino, dilute, pied and more. They are active, always chirping like the other varieties. These masked birds make a very sophisticated and chambered nest of natural material.